The Harlequin Puppet Theatre - Britain's First. The Harlequin Puppet Theatre, the first permanent puppet theatre to be built in Britain, opened on July 7th. 1958. It was built as headquarters for The Eric Bramall Marionettes. This touring company, founded in 1944, settled as company in residence presenting a repertoire of opera, plays, musical comedies, fantasies and divertissements of all kinds. The theatre is run privately and receives no kind of financial aid from Commerce, the Municipal authorities or the Government. The theatre was directed by its founder, Eric Bramall, until his death in July 1996. It continues under the directorship of his partner, Christopher Somerville, who has been closely associated with the Harlequin since its earliest days. This charming theatre seating 120 people is situated in its tree shaded garden only a few yards from the sea. The building, an architectural prizewinner, is of wood, glass and local stone. 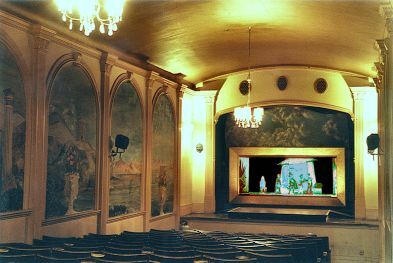 The interior is an eccentric but delightful mix of gold and red plush, of italianate frescoes and ornate plasterwork.The 240cm x 100cm gold proscenium frames the stage where appear the majority of productions using 60cm marionettes. Forward of this is a large apron stage upon which are presented the cabaret-style marionettes, a feature of which the Harlequin has become famous. 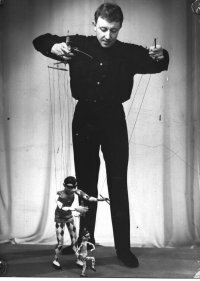 Floorshow puppetry, where a marionette is manipulated, without stage or scenery, in full view of the audience, with only the concentrated illumination of a couple of spotlights to aid the illusion, is now a widely adopted form of presentation which was pioneered by Eric Bramall. It has become a tradition that however lavish the current production at the Harlequin, the performance always concludes with Marionette Cabaret presented in this style. 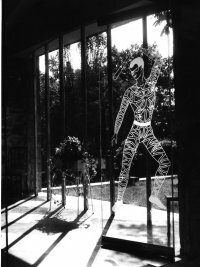 Although occasional productions have presented Shadow Puppets, Rods and Hand Puppets, the Harlequin is principally devoted to Puppets on Strings, a form of puppet so masterfully manipulated by Bramall and Somerville. In addition to its performances to the public the Harlequin also offers tuition in marionette manipulation to professional puppeteers and to dedicated amateurs. The theatre opens to the public for short seasons in February, October, and at Easter and Whitsuntide, and throughout July and August. Eric Bramall and Christopher Somerville were responsible for Britain's first ever International Puppet Festivals, held in Colwyn Bay in 1963 and 1968.